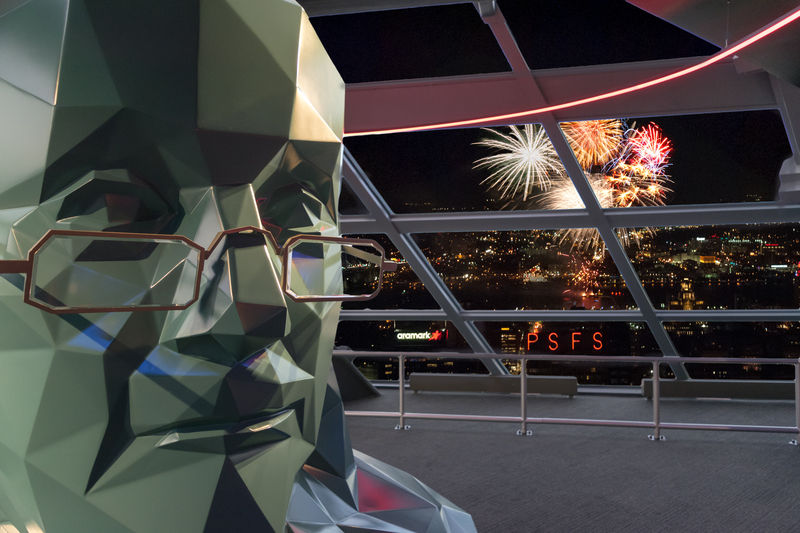 Craft Concepts Group (the minds behind BRÜ Craft & Wurst, Tinsel, Tradesman’s, U-Bahn, Uptown Beer Garden, and Cinder Copper & Lace) and One Liberty Observation Deck bring you an exclusive midnight celebration you won’t soon forget. Ring in the new year high above the city as the sky explodes with fireworks. Where better to see the light show than 57 floors up? Early bird general admission sold out nearly instantly. Don’t miss Philly’s most anticipated New Year’s Party for 2019! For just one night, you can be anyone. No name, no face, just one of many looking to let it go for the night as you wait for the new year to dawn. Escape underground below the streets of Midtown Village for U-Bahn’s 4th New Year’s with U-Bahn’s black-tie masquerade party from 9:00pm to 2:00am. Enjoy five hours of premium open bar, live music and DJ, hors d’oeuvres and more. Tickets starting at $100 general admission and up for VIP including table service, upgraded beverages and other perks to help you ring in the new year like a boss. Ring in New Year’s Eve at Philly’s hottest new restaurant and nightlife destination, Tradesman’s, in Center City. Housed in the historic Tradesman’s Trust Company building with its architectural charm and 34 beer taps, this party will draw all of Philadelphia’s nightlife trendsetters. This contemporary factory-like complex is designed to manufacture the ultimate NYE event. This mega party features a 5-hour premium open bar, ensuring the drinks are flowing. A live DJ will be on the decks to keep you dancing all night, playing mashups of your favorite Top 40, hip-hop, and club hits. Enjoy complimentary party favors to get in the NYE spirit, along with complimentary early evening bites to start your night. You won’t miss a second of the action as the DJ leads the live countdown to midnight. Occupying the former Tradesman’s National Bank – where it gets its name – the venue honors its history by keeping the bank’s antique ceiling and bold steel columns. Neon blue lights breathe new life into the ornate ceiling, while a wall of flat screen TVs commands attention. Known for its extensive beer and whiskey menu, Tradesman’s is an architectural feat and the perfect place to celebrate NYE. Its enviable Chestnut Street location means you’ll be right in the middle of the action, and its sound and lighting system is unparalleled across Philly. You’ll be swept away by the building’s eclectic industrial-meets-historic vibe, featuring exposed brick, wire fencing, and polished wood. With its 23-foot vaulted ceilings and mezzanine overlooking all the excitement, this party celebrates the wonder of NYE. Get down at the ultimate New Year’s Eve event in Philly, and see why local partygoers have been raving about Teddy Sourias’ hottest new venue. At Tradesman’s NYE, you’ll be a part of Philadelphia nightlife history. Rittenhouse Square’s newest hotspot, Stats on 17th, is hosting Philadelphia’s party of the year this New Year’s Eve. Flooded daily with locals eager for good vibes and rowdy fun, Stats has already become a Philly favorite, but we’ll take it up a notch this New Year’s Eve for an all out blast off into the new year. If you’re looking for an unpretentious all-around good time this New Year’s Eve, this is your spot. Decked out with high tech accents like a long wall covered in flatscreens, Stats on 17th surrounds you in entertainment that will only be elevated by the live DJ who will spin an electrifying mix of Top 40, hip hop, and house music all night long. Prepare to dance well into the morning because you won’t have to go far off of the dance floor for every amenity you could possibly want. A five hour premium open bar lets you choose from an array of cocktails all night while a light buffet keeps you fueled for the bash of the year. Seconds before midnight, the DJ will count the crowd down to an epic launch into the next 365 days and glasses of complimentary champagne will clink as we toast to what’s to come. Pick up a VIP package for even more amenities like reserved seating on tufted chocolate leather couches and bottle service. The ever popular Rittenhouse Square pulls Philly’s most enthusiastic partygoers out on a nightly basis, but this New Year’s Eve the bar at its center is where everyone will be. Stats on 17th takes Philly standards like beer buckets and elevates them to sleek white geometric containers that house chilled bottles for your whole crew. This hotspot is as Philly as Philly gets with walls covered in your favorite Eagles, Flyers, Phillies, and 76ers paraphernalia and you’ll be amongst the city’s most devoted revelers this NYE. Owner Justin Veasey has said he wants to “bring the nightlife back” to Philly, and that’s exactly what he’s done at this happening haunt. There’s no doubt that this is Philadelphia’s new nightlife destination and you’ll get to be a part of it on its most exciting night of the year this New Year’s Eve. University City’s swanky hot spot Dim Sum House is hosting its first ever NYE event in luxe fashion. Ring in the New Year at one of Philadelphia’s hottest restaurant and newest nightlife venues. Sip on your favorite cocktails as all tickets include a 9pm – 2am premium open bar, come hungry as there will be a full buffet of the dim sum that food writers have fallen in love with, then party the night away with a DJ, Pool Table and enough seating for everyone to snuggle up when the time is right. Specials: Ticketed event details below. Schnitzel, tinsel and more, Brü Craft & Wurst pulls out all the stops in authentic German Bier Hall style this New Year’s Eve. Featuring amenities like a five-hour premium open bar and a live DJ performance, ring in the new year, exclaiming “Prostit Neujahr” which translates to “May the new year turn out well” and raise a pint to the year past, present and yet to come. Tickets are $69-119 and include five hour premium open bar (9pm-2am), buffet-style hors d’oeuvres, live DJ performance, live DJ countdown, complimentary champagne toast, table/bottle service options for VIP ticketholders. Prost! Make this New Year’s Eve one you’ll remember—or at least, want to remember—by ringing in the New Year at Brü Craft & Wurst. Philadelphia’s only home-grown premiere Christmas pop-up bar presents its first New Year’s Eve celebration! Tinsel Winter Wonderland New Year’s Eve 2019 will bring you into the single most festive spot in the city to ring in the new year. Celebrate for a final time before Tinsel heads North for the winter. Doors open at 9:00pm. Premium open bar from 9:00pm to 2:00am. Hors D’oeuvres, DJ, more. Let the ultra sleek pin-up inspired bar at 11th and Samson in Philadelphia’s trendy Midtown Village neighborhood host your New Year’s Eve Party. The downstairs area will feature a decadent buffet featuring some of Betty’s favorite food items, a private bar area for you quiet conversations and a large area with tables. Go upstairs and turn up with DJ spinning top 40, throwbacks and all your favorite hits. This truly beautiful space will give you a night that you won’t soon forget with a ball drop and champagne toast at midnight! This New Year’s Eve celebrate in Philadelphia’s sleekest contemporary space, Cinder Copper & Lace. This minimalist hotspot is located in the center of the bustle of Rittenhouse square – Philadelphia’s most popular neighborhood. Don your chicest attire because when the clock strikes twelve you’ll be taking on the dancefloor with Philadelphia’s best. New Year’s will go well past midnight at this Rittenhouse hotspot. A live DJ will spin a festive mix of mashups, pausing only for the countdown we’ve all been waiting for. Sip cocktails under copper lamps hanging above the long wood and metal counter because Cinder is serving up a five hour premium open bar. Pick up a VIP package and take this night to the next level with amenities such as bottle service and reserved seating. Nick’s Bar and Grille is one of the top spots to celebrate a casual New Year’s Eve with the whole family and your friends. By day, bring the kids after the countdown at Franklin Square in Historic Philly or come before the main fireworks on the waterfront. The full menu and some specials will be served. By night, bring your friends and get ready to let loose. This is the perfect spot for a casual, warm and fun New Year’s Eve without the reservations and without the fuss. Look for a complimentary champagne toast at Midnight, noise makers drink specials, menu features and no cover ever. The End of Days is near.. the only place to survive the New Year’s Eve Apocalypse is at Mad Rex, the world’s first post-apocalyptic virtual reality experience restaurant. Indulge in the cuisine of the new world with Chef Brandon Ferrio’s 3-course dinner available at http://themadrex.com/. Dance into the new year with sounds from DJ Rebel. Post-apocalyptic entertainment will be featured throughout the night. A complimentary champagne toast at 12am to bring our survivors into the New World will be provided. At the close of the night, survivors have the ability to partake in complimentary transportation and entry to Gardendale Social Club from 2:00am – 3:30am. This Mega NYE Extravaganza features multiple rooms and formats geared toward all age groups 21 years & up. The Old News Band (NEW FOR 2019) and WDAS Radio Legend DJ Gary O headline the entertainment lineup along with local DJs spinning top 40, throwback, oldies & party favorites. If you are looking for an elegant but affordable celebration to satisfy both the young and young at heart, then this is the party for you. Other features include 6+ bars, party favors, interactive photo booth, balloon drop & champagne toast at 12AM! Enjoy the tastes of our GOURMET FOOD & CARVING STATIONS inspired by our award winning chefs along with a 6 HOUR PREMIUM OPEN BAR. Bring in NYE 2019 in Philadelphia’s Manayunk neighborhood at SONA! With 3 floors and two DJs you’re sure to have a night that you’ll never forget. Ring in the New Year with a 5 hour premium open bar, multiple bars on each floor, amazing gastropub inspired buffet, DJs spinning Top 40, Hip Hop & Throwbacks and a Champagne Toast at midnight. Spend NYE in historic Old City at one of the neighborhoods top bars for great food and ambiance. Enjoy a fabulous, critically acclaimed low country dinner, 6 hour premium open bar, DJ entertainment and champagne toast on Market Street at midnight as we watch the Penns Landing Fireworks! Tables are extremely limited and this event will sellout as it does every year. Specials: No cover, no reservations required, free party favors, groups welcome, half price drafts from 10:00pm to 11:00pm, champagne cocktail specials including specialty cocktail for the evening— The Midnight Rose (sparkling wine, aperol, orange bitters, rose syrup for $7.) We’ll also be gifting limited edition postcard & poster art by Defective Pudding, plus full kitchen menu until 1:30am!